China’s growing global economic importance is one that cannot be ignored, and the government of Sierra Leone has made a bold decision to establish a commercial office in Shanghai, Eastern China. The commercial office was officially opened for business on Monday, 16th June 2014. This is an internal arrangement aimed at decentralizing the activities of the embassy’s commercial section, aimed at effectively attracting more investments and trade opportunities from China to Sierra Leone. The office opening event was attended by staff from the Embassy in Beijing, including the Ambassador and wife, Deputy Ambassador and the Press Attaché. Xian Nainjie – the CEO of Shanghai Juxi Asset Management and Senior Member of the Shanghai Chamber of Commerce, has been appointed as Sierra Leone’s Commercial Counsellor, in charge of the Shanghai Office. This colourful ceremony was also attended by dozens of Chinese Business men and women, potential investors and friends of Sierra Leone. Speaking at the ceremony, His Excellency Victor Bockarie Foh highlighted the importance that Sierra Leone attaches to seeking more trade and investment opportunities from China to Sierra Leone, so as to help achieve president Ernest Bai Koroma’s Agenda for Prosperity. According to Ambassador Foh, the opening of a Commercial Office in Shanghai is aimed at reaching greater number of potential private sector investors who may be willing to invest in trade, commerce and tourism in Sierra Leone. “This is also an indication of our desire and commitment to expand and build upon our long and very cordial relationship with the People’s Republic of China,” says Ambassador Foh. He called on the new Commercial Counsellor to look at Sierra Leone’s untapped investment potential in various sectors, such as tourism, real estate, water supply, electricity, roads and infrastructure, transportation, medical and health, ports, railways, telecommunications, and marine resources. Ambassador Foh called upon Mr. Xia to use his good offices to attract trustworthy investors to participate in all sectors of Sierra Leone’s development, based on president Ernest Bai Koroma’s agenda. According to Ambassador Foh; “we need our eyes and ears opened in China, in order to capture business investments and build sound diplomatic relations with this great country…,” hence the need for the decentralization of the commercial section of the Embassy in Beijing. “By our internal arrangements and in the interest of both Sierra Leone and China, we are determined to reach every administrative compartment of the People’s Republic of China,” says Ambassador Foh. 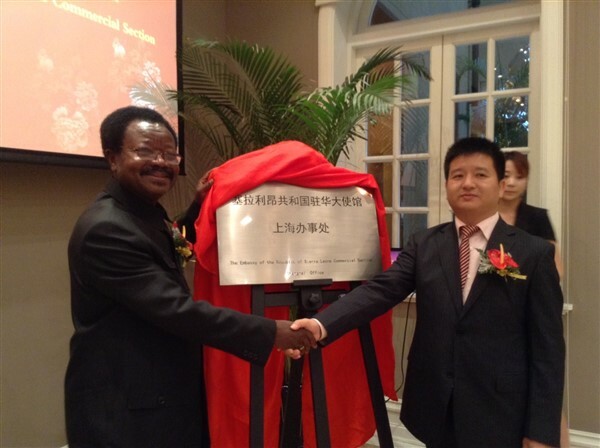 The chairman of the Board of Shanghai Juxi Asset Management – Wu Chen, promised on behalf of the company to do all they could to produce good results for Sierra Leone. “We will use our team to do the best. 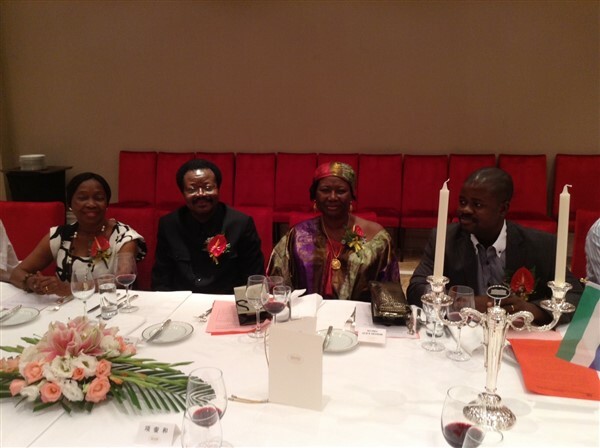 We will bring Sierra Leonean culture and friendship here into Shanghai, and we will use our expertise in business to take investments into Sierra Leone…,” said Mr. Wu Chen. 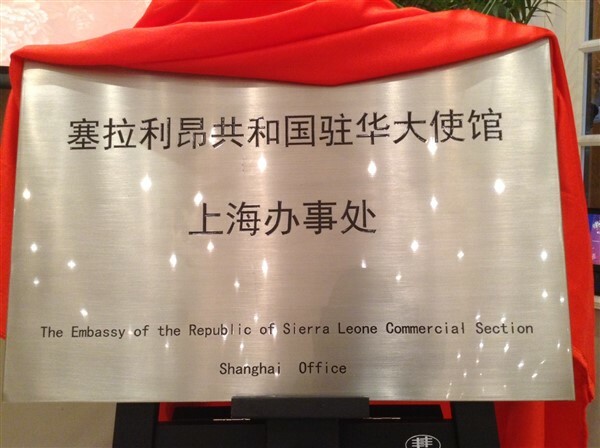 Xia Nianjie – the new Commercial Counsellor said, he was honored to be appointed Commercial Counsellor for the Embassy of Sierra Leone in China, in charge of Shanghai. Sierra Leone, he said, has got great investment opportunities, especially in petroleum, marine sector, tourism, the development of people to people friendship and human resource capacity building. Both Sierra Leone and China, Xia said, have had over forty years of strong, cordial and unbroken ties – both at the levels of people to people and diplomacy. According to Xia, the opening of a Commercial Section in Shanghai – a massive business centre is a manifestation of the long standing ties between the two countries. He said that he will seek to work towards the mutual benefit of both Sierra Leone and China, and promised to push towards economic and trade cooperation through the Shanghai Commercial Office. Shanghai is the second largest Chinese city, with a population of about 24 million. It is one of the four directly-controlled municipalities in China, and has the world’s busiest container port. Shanghai is a major commercial hub for China and a well recognized global financial centre.